The cost of each entry is £1. Players may purchase more than one entry, and payment must be in advance. Entry is open to all residents of the UK but excludes parties directly involved in the administration or management of the Weekly Lottery. The winning number will be published on the MDUK website www.musculardystrophyuk.org/lottery and will be available from the Weekly Lottery Helpline on 01628 821 983. Results will be available from the Monday following the draw. Winning combinations will be for players’ lottery numbers which match three or more of the digits in the correct position within the winning number. Prizes for the Weekly Lottery are published on the MDUK website www.musculardystrophyuk.org/lottery. There are no alternatives to any prize and no interest will be payable. Prizes will be sent by cheque within 21 days. All profits from the Weekly Lottery go to Muscular Dystrophy UK. MDUK is not responsible for any delays in bank payments. MDUK reserves the right to use the winners’ names for promotional purposes. These will only be in summary, for example Mrs Jones from Berkshire. MDUK or its External Lottery Manager may (without giving any reason or notice) decline to accept an application, cancel an existing subscription or terminate or suspend the lottery scheme. MDUK or its External Lottery Manager’s decisions made regarding the rules shall, once made, be final and binding. No detail in an application may be changed in any way once it has been submitted, except for contact details such as change of address. 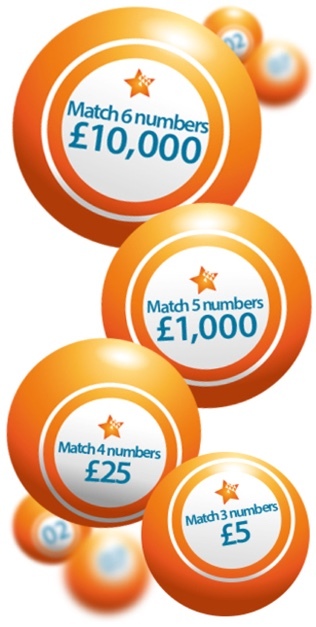 The rules are subject to change by MDUK or its External Lottery Manager. Copies of the latest rules will be published on www.musculardystrophyuk.org/lottery. Promoter: Cecile Laurent, Head of Direct Marketing and Digital, Muscular Dystrophy UK, 61a Great Suffolk Street, LONDON SE1 0BU. For full terms and conditions visit www.musculardystrophyuk.org/lottery. If there are any changes to the amount, date or frequency of your Direct Debit Muscular Dystrophy UK will notify you 10 working days in advance of your account being debited or as otherwise agreed. If you request Muscular Dystrophy UK to collect a payment, confirmation of the amount and date will be given to you at the time of the request. If an error is made in the payment of your Direct Debit, by Muscular Dystrophy UK or your bank or building society you are entitled to a full and immediate refund of the amount paid from your bank or building society. If you receive a refund you are not entitled to, you must pay it back when Muscular Dystrophy UK asks you to.